We created a clean and contemporary company handbook design that communicates to the audience in a professional yet friendly manner. Salt Union, part of Compass Minerals, drew on Parker Design’s extensive experience to ensure they got the very best solution for their company handbook design, which requires a very considered approach. 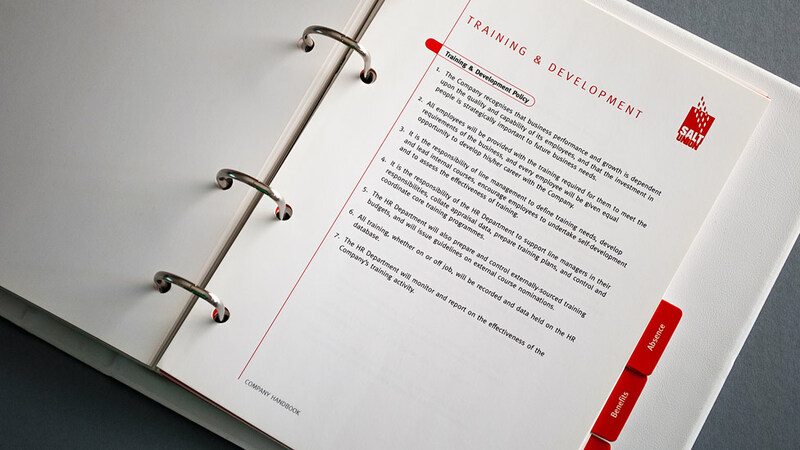 A company handbook contains vital information for its employees, setting out processes and policies and procedures. The handbook design therefore needed to have a very professional tone, and yet be friendly, easy to follow and easy to navigate. And by the very nature of the contents, the company handbook also needed to be updated easily and in a cost efficient manner. 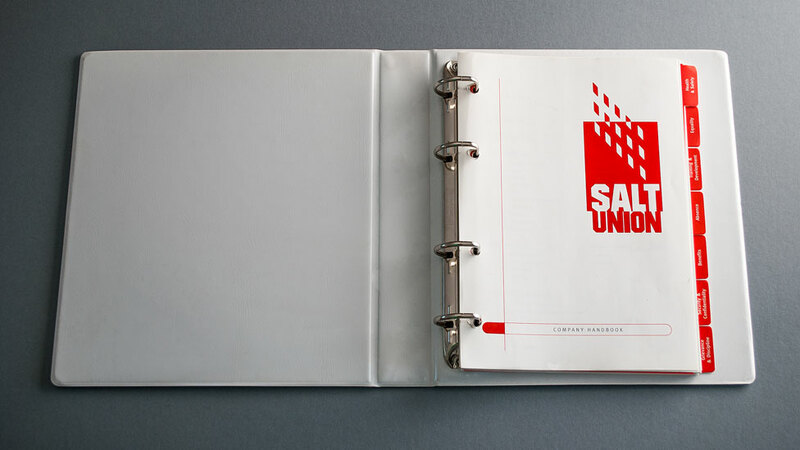 To achieve this we produced Salt Union’s company handbook design as an oversized A5 ring binder and inserts. Picking up on the brand colour we created a clean well laid out page design with legible typography and easy to follow formatting. With well over 100 pages of content it was important to clearly separate the different sections of the handbook to help navigate the reader to the correct information. To do this we used striking red tabbed dividers, which we laminated to protect from heavy use. We also opted for not having page numbers – this allowed for individual or groups of pages to be updated as and when required, reprinted and dropped back into the handbooks without disrupting the overall page order, avoiding the need for a full reprint and maximising our client’s investment.